Russia has surprisingly shied away from supporting the authoritarian status quo in Algeria as it seeks to secure its long term interest in the North African country, notably in terms of armament contracts. It was not a coincidence that Deputy Prime Minister Ramtane Lamamra paid his first international visit to white wash the regime to Moscow earlier this month. But to his disappointment Moscow fell short of showing its outright support for Bouteflika’s proposal to quell protests. 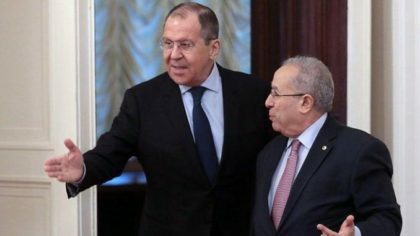 “The recent events in Algeria form part of the country’s domestic affairs, and Russia hopes that the republic will resolve its issues in a constructive way, Russian Foreign Ministry Spokeswoman Maria Zakharova stated on March 15. Facing pressure from the street, Algerian president gave up on his fifth term bid and promised constitutional reform but stopped short of stepping down, defacto extending his fourth term, a move that further irked protesters who staged yet Friday (March 22) one of the most spectacular protests in the capital calling for the President and the regime to step down and for a new Algerian republic. “Russia’s cautious reaction to unrest in Algeria reflects Moscow’s desire to maintain long-term influence in Algeria, regardless of the outcome of the protests,” a Policy brief published by Carnegie said. The Russians are aware that the days of Bouteflika and his allies are numbered and are acting cautiously to keep good ties with the upcoming leaders. Russia’s supreme goal is to keep Algeria dependent on Russian weaponry. From 2014-2018, Russia was Algeria’s top arms supplier, providing 66% of Algeria’s armament imports. That’s no small figure, as Algeria was the world’s fifth-largest weapons importer during that period. For Moscow, Algeria has been a backer of its anti-Arab Spring stances. Algiers showed support for Moscow in Libya and Syria. Russia’s approach will allow it to preserve its arms contracts and pursue lucrative investment opportunities, regardless of who holds power in Algeria although Moscow has apprehension towards the ideology of the opposition, which may lean towards the EU or the US, two sides that have openly supported the popular protests.